Get the Ultimate Training in Mind-Body Integration. 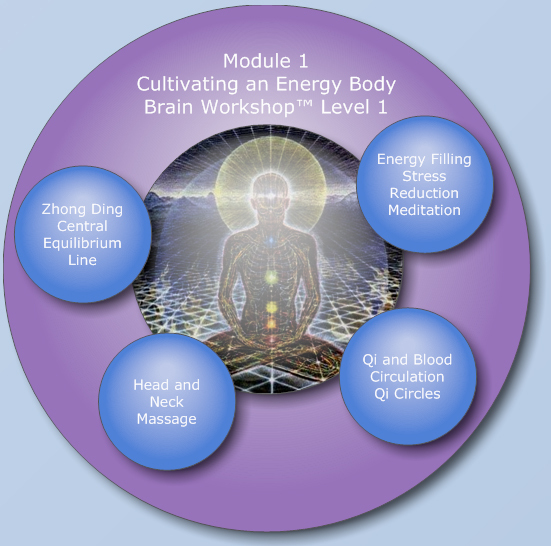 Module 1 contains an extremely robust visualization, meditation and self massage program that can bring a high level of awareness of the energy in your body. The goal is to experience yourself as an energy being. 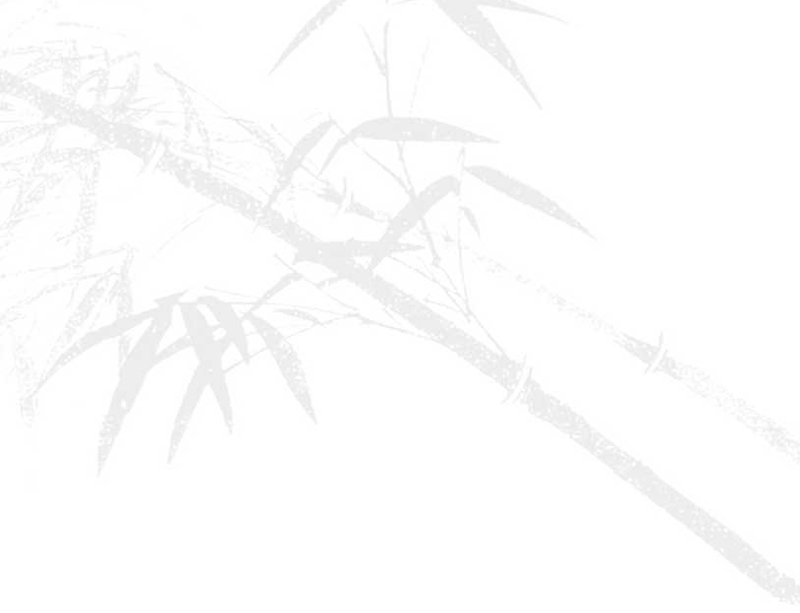 The materials presented explain the physiology of practicing qigong. In practice, this program can relieve stress, anxiety and chronic pain by promoting relaxation, sleep and healing blood circulation to the brain and internal organs. The visualizations and simple exercises, performed both sitting and standing, are used to refine mind intention and build qi. Self massage and meridian massage enhances qi flow, blood circulation, lymphatic circulation, and immune system function. Module 2 contains videos and supplemental materials to help you understand the physical and energetic principles of central equilibrium, one of the most important fundamental principles in tai chi. Central equilibrium training is essential for understanding how to create balance, strength and flexibility in the movements of daily life. With practice you can repair posture to alleviate chronic health issues including chronic pain, and to activate neurorehabilitation and repair. 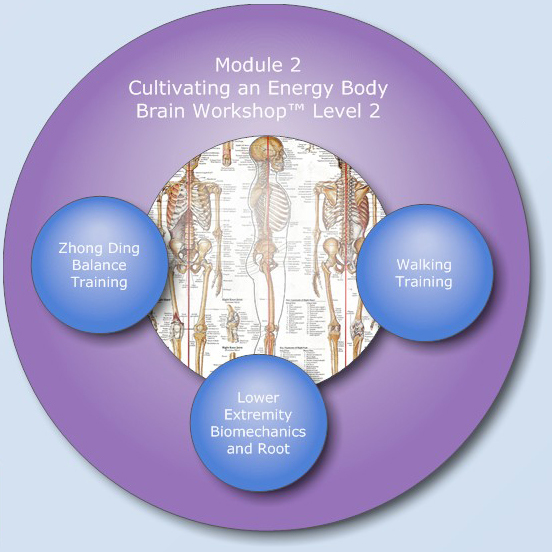 Brain Workshop™ specifically addresses additional movement principles for brain health, especially important for persons with stress, brain injury, Parkinson's, stroke. Module 3 contains videos to help you understand the physical and energetic principles of power stretching. Power stretching is essential for whole-body or one-unit, connected, loose, relaxed, spiraling power in all styles of martial arts. Power stretching is the next step essential for understanding how to repair posture to alleviate chronic health issues including chronic musculoskeletal pain, and to activate neurorehabilitation and repair. Module 4 contains videos and supplemental materials ranging from detailed techniques to overarching concepts on the biomechanics of key movement principles of taijiquan. 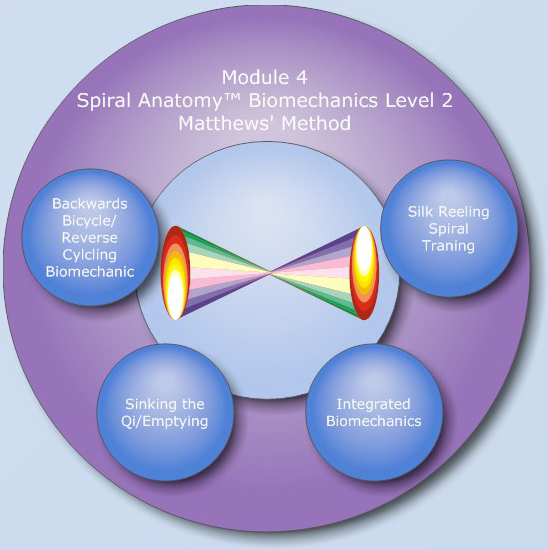 This Module introduces the Matthews' Method, the biomechanics of silk reeling and spiraling and is the next step essential for understanding how generate superior power in martial arts, and how to repair posture to alleviate chronic health issues including chronic musculoskeletal pain, and to activate neurorehabilitation and repair. 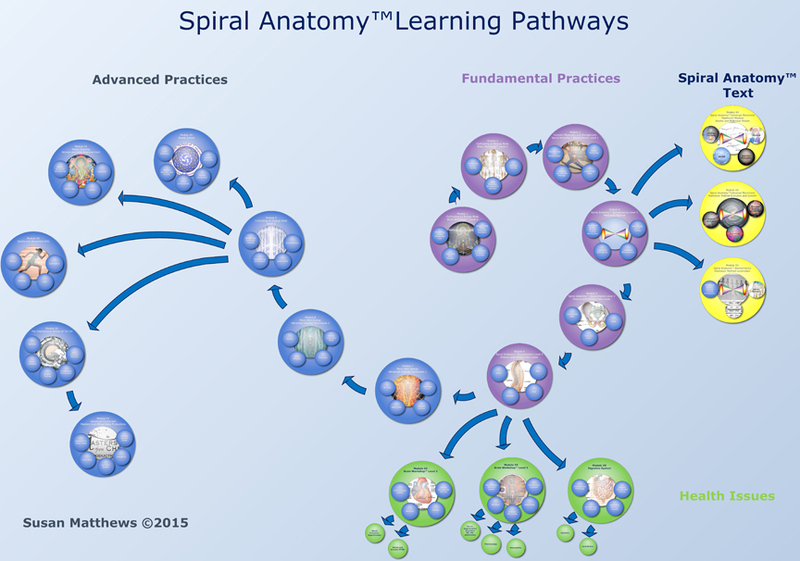 Module 4 - Spiral Anatomy Biomechanics Matthews' Method: Best videos in one package available soon. includes mind training for moving energy. Training the mind to build and direct energy to move to accomplish any action, added to the mechanical spiral, enhances strength even more. Intent, energy and physical can be integrated to release maximum power. Mental practice and visualization (for example, straight central equilibrium line, dantien rotation, spiraling kinetics, perfect yin yang, expanded energy awareness into the space) allows the brain to control the whole body in integrated spirals. "Hello Susan, I was one of the fortunate people to have participated in your Spiral Energy class in Mission Viejo, CA...Thank you for sharing your knowledge with me. I regard this as a turning point in my life. I feel that my eyes have been opened to a new way of living and getting more out of life. Thank you again." My approach in teaching these principles is unique because it has has provided a model and a language for understanding this universal mechanical and energetic movement: a pattern, which generates efficient, relaxed, effortless movement, using less muscle and more spiraling bone strength. By universal I mean it is based on spirals (and later waves) which are found in all living, growing things in nature including the way fish swim, snakes slither, birds fly, and even inherent in why trees and seashells grow in spirals. By universal movement, I mean it is based on spirals found in all living, growing things in nature. If you twist or rotate, need balance, strength, endurance, focus or speed, then you can improve that motion through spiral training and the other elements in internal martial arts. 1. Biomechanics of Rooting: Strength and balance, a strong root, is obtained with understanding postural alignment in gravity, lowering the center of balance, and the mechanics of transferring weightedness and other forces to the feet. 2. Biomechanics of Spiraling Bones: "Chan SSu Chin" practice strengthens and connects all the joints and tendons into one continuous "snake." When one part moves, all parts move. Physical strength with plasticity, fluidity, and relaxation can be increased through the use of integrated "bone" power rather than through reliance on muscular strength. Later, spiraling contains and generates a "jin/chin/jing" or force which can be used. Spiral training is commonly taught in Chen Style tai chi basic exercises. The exact Spiral Anatomy™ biomechanics can be trained as a backwards bicycling motion that starts in the sacrum and moves through every vertebra, joint, and muscle. Susan Matthews considers this her signature contribution to the body of tai chi knowledge. This motion allows beautiful integration around the zhong ding (central equilibrium line) and energetically around a complex and sophisticated dantien. Physical stress, muscle tension, pain, compression in the joints, compression of internal organs, reduced blood and lymph circulation can all be alleviated by understanding how the physical structure can spiral out of shape from tension. With education, time and practice the structure can be spiraled open and into balance. This open, relaxed structure is required for maximum relaxation and qi flow. I have been fortunate to train with Master George Xu for the last 20 years. George gives us most of this internal information that I have blended with Western biomedical sciences. 3. Energetics of True Grounding: Energetically grounding/filling/connecting the physical body and energy body with the energy outside the body helps establish a relationship with earth and sky energy in order to flow with it naturally. Later, this becomes an infinite source of power which can be borrowed. Advanced mind-energy-physical integration in tai chi and qigong allow one to develop the Subtle Energy Body. Visualizations and mind focus practices are described on this page. 4. Waist/Hip Mechanics: Stable, rotational hip mechanics and using sacrum and tailbone function in transmitting movement through the spine. 5. Dantien Energy Power: Dantien (abdominal region) energy rotation creates fluidity in movement, and movement in which the body or torso moving at the center generates all movement of the extremities. Dantien training can be found on Blood Circulation and Energy Gathering Qigong dvd by Susan Matthews. A higher level of dantien training can be experienced with Grand Master Wang Hao Da Neijing Training dvds. 6. Yin Yang: Spiral Anatomy™ physical and energetic movement allows for perfect yin yang physical and energetic balance in all directions across the body: left/right, front/ back, up/down, in/out, empty full, expand/contract. This is a requirement for fluidity and softness in push hands practice. Separation of Yin-Yang along the centerline into right-left, front-back, in-out, and up-down has several benefits that combine to create a fluid center and release a stiff core. Up-down separation of yin-yang along the centerline loosens and stretches the spine. Energetic fire rises up, is light, empty, loose and alive. Energetic water sinks down, maintains a dynamic root, and generates the fire up. Left-right yin-yang is required for a flexible spine and loose-open shoulders. Left-right also is required for perfect balance. Yielding, or yin action, must create the corresponding yang force in order to remain light, to be comfortable, to remain undisturbed and in control of your center. Front-back balance keeps the spine vertical and upright. Front-back separates the energy so that in partnership a common center is experienced as a heart-mind connection. In-out separation focuses on awareness of the space and also allows a beautiful heart-mind connection. Expansion and contraction adds a communication with one's own heart and the heartbeat of the earth/universe. 7. Back Power: Back power is generated out of the waist and includes connecting the dantien in front to the ming men in the low back. Sinking the shoulders into the low back and opening (flattening) the low back transfers shoulder power to the more powerful hips and legs. Power stretch, a form of isometric stretching, connects the upper and lower spine. 8. Tui shou: Push hands sensitivity exercises train the practitioner to yield to the forces directed at them, gathering, redirecting and releasing power. Thinking about dealing with the complex forces at play in skiing and other sports deal in a similar way is useful. The advantages of "flowing with" rather than "fighting against" are obvious. 9. Structure and Biomechanics of the Spine: The position of the hips and sacrum, dictated by specific muscle tension in the pelvis, dramatically effects the position, function and tension of the neck and every other piece the body. Getting better means changing structure and teaching each part of the body how to perform unified and energetically integrated movement directed by singular focus on the core. 10. Energy in the Spine: Zhong Ding Jin, central equilibrium force or line, suspends the spine between Heaven and Earth, unifies yin and yang and allows cultivation of spiritual intent. Wang Hao Da was a master of zhong ding. Energy transmission from heaven and earth through the heart is an expression of the creative spirit of the individual, beautiful, wise and full of love. Tracy is 36 years old, has 25 years experience as a skier, eight years as a martial artist, and is a mountain bike enthusiast. Tai Chi, like all-internal martial arts, can be described in terms of physical biomechanical movement, visualization of movement of internal energy, and mental or spiritual intent. 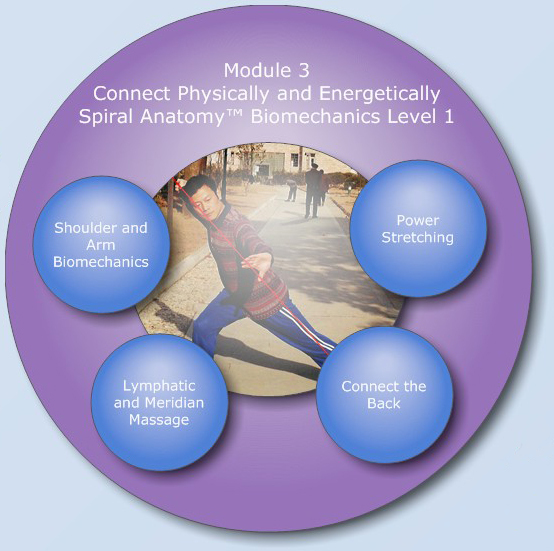 All of these components, must be integrated with each other to create effective, relaxed, whole-body movement. Done properly, this movement is full of power, which can be gathered and released, and also contain the potential for healing the body and for promoting spiritual development. Susan Matthews is a scientist who teaches taiji. She approaches the study and practice of this ancient Chinese martial art form as a scholar who has trained extensively in neuroscience, biomechanics and anatomy. She does taiji for her own health, self-defense, and strength training and teaches what she knows to students who approach their own professional and personal lives with equal vigor. Susan Matthews is available for seminars to private groups and businesses. Design your own or choose from the following programs: Cultivating a Daily Practice Qigong for Blood Circulation, Women’s Health, Rejuvenation and Longevity, Arthritis and Chronic Illnesses, Tai Chi in the Workplace, Advanced Biomechanics and Mind Control for Superior Athleticism, Advanced Biomechanics and Orthopedic Integration for Medical Professionals. Taijiquan and qigong strengthen and tune the body so that it becomes like a violin string. for health, for healing, for spiritual wisdom.